Summary: Covering up her own murder was one thing, but faking life is much harder than Kaylee Cavanaugh expected. After weeks spent “recovering,” she’s back in school, fighting to stay visible to the human world, struggling to fit in with her friends and planning time alone with her new reaper boyfriend. Through out the whole series since the beginning in typical YA style I thought Nash and Kaylee were going to be together "forever" yes they would have some heart ache but they would end up together eventually happy ending and all that. But Rachel Vincent took a spectacular risk (like I mentioned in my previous review for if i die) and Todd was brought into kaylees love life and changed it completely and I am so glad. A lot of people were annoyed but boy I was excited. Love, excitement, death. Blood, sweat and tears are only some of the words I can use to describe the brilliance of this book. I never get tired of reading the scenes between these characters! Rachel takes you to a place that challenges your imagination and screams at you through the page. Todd and Kayley are as amazing as ever. Their relationship develops and the way Rachel writes their scenes you truly believe that this relationship was meant to be. I couldn't help but cheer for them, cry at their best moments and at each scene they had I had a romantic sigh from within. Also Sabine. You know some people didn't take to Sabine but I will say that you really start to like her in this book. Rachel has shown Sabines kind side and you start to really enjoy when shes in a scene she's turning into a very likeable character! The plot is amazing. It thickens and gets deeper. Questions are answered beautiful scenes are happening and heart ache has never been more prominent. from the amount of detail to the amount pages. I think its descriptive and effective. Rachel has created word images so vivid that it is almost like watching a movie. She takes you for a romp through kayleys not so alive life with a team of Mara, Reapers and banshees and finds themselves in a action packed suspenseful event with the evil Avari that had my heart facing and had me excited from beginning to end. I could say so much more about this book but I would probably talk spoiler after spoiler. iIl leave you with this: there are only a small amount of series that I've fallen in love with, without getting bored and this is one of them. I feel like I had a great amount of years with these books and I thank Rachel for bringing Todd Kayley and Nash into my life..... But I'm just not ready to say goodbye. I don't think I'll ever be. Great review! 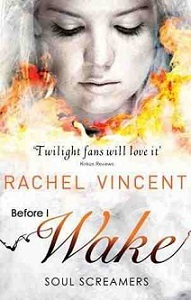 I love anything written by Rachel Vincent and I adore this series so much . . . can't wait to read this one!